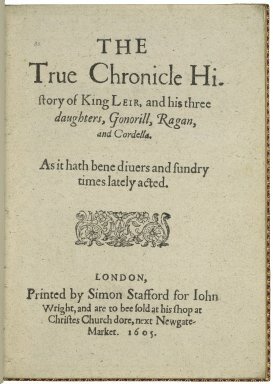 THE True Chronicle History of King LEIR, and his three daughters, Gonorill, Ragan, and Cordella. As it hath bene diuers and sundry times lately acted. LONDON, Printed by Simon Stafford for Iohn Wright, and are to bee sold at his shop at Christes Church dore, next Newgate-Market. 1605. Title page imaged from Folger call number: STC 15343. Image is not from the transcribed copy. Wiggins suggests a best-guess creation date of 1589, range 1586–94.